RTÉ’s Reflecting the Rising on Monday 28 March will be the “biggest public history and cultural event ever staged in Ireland”. EASTER MONDAY IS fast approaching. On that day 100 years ago the first shots of the Irish Easter Rising were fired in anger. 28 March will be the official kick-off for the centenary of the 1916 Rising. And there are a LOT of things planned for Dublin on that date. In fact, it’s set to be the “biggest public history and cultural event ever staged in Ireland” according to RTÉ. The state broadcaster will be running the whole shebang – titled ‘Reflecting The Rising’ – across the city from morning until evening. To celebrate the launch, RTÉ presenters across the spectrum have donned period dress to get the public in the mood. The events on the day will cover talks, exhibitions, live music, guided tours, debates, films and much more, and it’ll all be based around historic buildings and landmarks from the rising itself. The events of Easter Monday will run from 11am to 6pm. And there really is a lot scheduled. In the south of the city there will be live music in St Stephen’s Green, with spoken word, trench walks and demonstrations of 1916 professions. There’ll be a massive céilí mór at Earlsfort Terrace and a 1916 children’s play-day at Merrion Square, together with a vintage vehicle collection, a carousel and more live music. 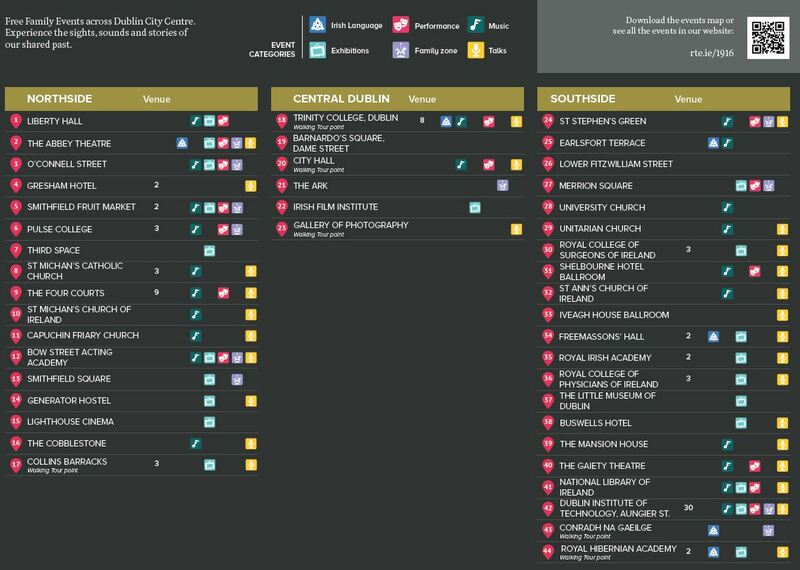 There’ll also be events in buildings across the south inner city, including DIT Aungier Street, the Royal College of Surgeons of Ireland, the Royal Irish Academy, the Gaiety Theatre, the Mansion House, and the Shelbourne Hotel. 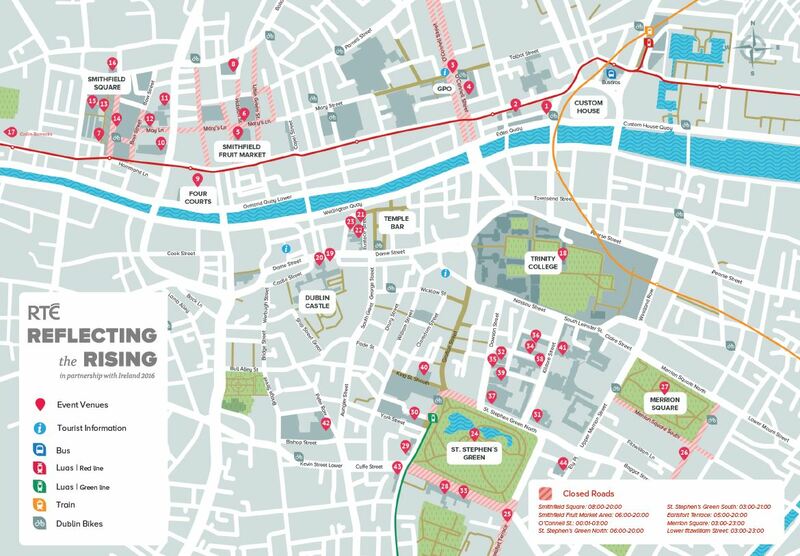 Walking tours will be departing from Barnardo’s Square / City Hall on Dame Street every 15 minutes throughout the day. Trinity College will be hosting talks and debates on subjects like the trials and executions of the Rising’s leaders, while the Irish Film Institute will be screening RTÉ’s Insurrection - the original docu-drama broadcast in 1966 to mark the 50th anniversary of the Rising. O’Connell Street’s pedestrianised area will be turned into a vintage music hall stage for the day, with performers telling the story of Easter Week 1916 through words and pictures. In Smithfield, the famed fruit market will be showing silent movies. There’ll also be vintage vehicles, street poets, music and drama. Meanwhile, indoor events on the northside are many and varied. The Four Courts will approach the Rising from a legal point of view: lawyers in the rising, law and order, looting, the trials of the leaders etc – all subjects will be covered by talks from senior members of the judiciary. The Abbey Theatre off O’Connell Street will be re-telling Seán O’Casey’s The Plough and the Stars though the eyes of its youngest character. The Lighthouse Cinema in Smithfield will be showing a range of 1916-themed films, and nearby Collins Barracks will be hosting a series of exhibitions and talks. Liberty Hall in the city centre meanwhile will host an exhibition surrounding the making of the 1916 proclamation, together with a concert titled songs of Labour and 1916. More than anything, Easter Monday in Dublin this year will be about families. There will be family-specific zones at St Stephen’s Green, Merrion Square, O’Connell Street, Smithfield Fruit Market and Smithfield Square, while DIT Aungier Street and the Bow Street Academy will open their doors for talks and workshops aimed at children and teens. You can try your hand at the games of 1916 at Merrion Square, have your hair styled, get up closed to vintage vehicles, or spin on historic carousels. The choice of workshops is huge – so planning a route on the above map isn’t a bad idea, while an “enhanced public transport system” will be in operation for Easter Sunday and Easter Monday to allow everyone to attend the centenary celebrations. You can find out more about transport into and out of the city on the days in question here. The whole day is set to be a party to remember. For more on the events of 28 March, Easter Monday, in Dublin click here. Email “Easter Monday in Dublin is set to be a family-friendly 1916 spectacular”. Feedback on “Easter Monday in Dublin is set to be a family-friendly 1916 spectacular”.